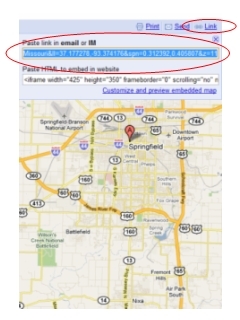 This page helps you to easily transform a map shown in Google maps for use with maplorer. Simply go to maps.google.com and navigate to the map you would like to use on your GPS. Display it in full screen. Make a screenshot and store the result as map_A1.jpg (crop to keep only the map without the frame, as explained on the maplorer page). Then, click on the Link in the top, right corner; copy-paste the link to the editor below and push the "Make .POS file" button. Repeat for as many tiles as you want.